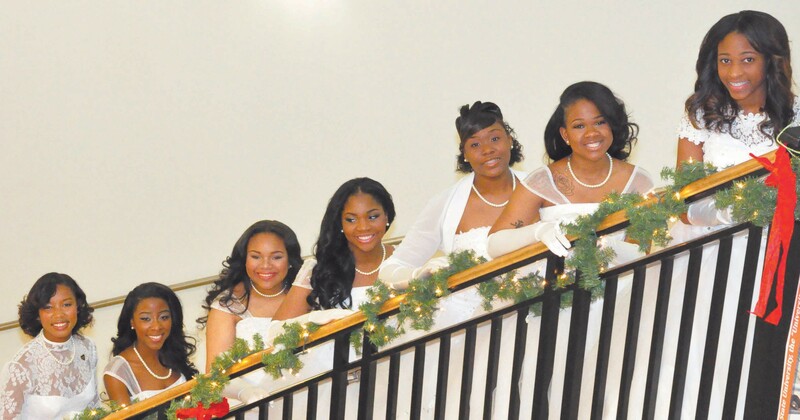 The 71st Annual Debutante Presentation and Ball was held on Friday, December 18, 2015 at Savannah State University in the Student Union Ballroom. The Beta Phi Lambda Chapter of Alpha Phi Alpha Fraternity, Inc. presented seven (7) Debutantes. The Debutantes were honored, following the Presentation, during the Annual Formal Alpha Ball. These seven young ladies are pursuing their dreams through post-secondary education. They are active in the community as volunteers to various charitable organizations and activities, and provided hundreds of hours of volunteer service. They are also high academic achievers and received many scholarships and awards. The Debutante Season began in January 2015 when the Prospective Debutantes and their parents/ guardians became acquainted with the Brothers of Beta Phi Lambda Chapter and the Alphabettes’ (wives and widows of the Brothers) in the Economic Opportunity Authority (EOA) Multipurpose room. Highlights of the season included Charm School conducted by Ms. Taqwaa F. Saleem, Beginning in June 2015 Alphabettes Elainor Ray and Valarie West worked with the parents and Debutantes on their Social event entitled “A Timeless Exultation of Queens” which they performed at Savannah State University on Saturday, November 28, 2015. Rehearsals were conducted by Alphabettes Mrs. Beverly Copeland, Wilmotine Ellis, and Valarie West. In January 2013, the chapter named the scholarships in honor of the late Lillie Jackson Ray wife of Alpha Brother Robert Ray. Mrs. Ray worked tirelessly with the Debutantes from 1987 through October 2012. The Brothers of Beta Phi Lambda Chapter of Alpha Phi Alpha Fraternity, Inc., President Brother Christopher Brown and the Alphabettes express their sincere congratulations to the 2015 Debutantes and their parents/guardians.